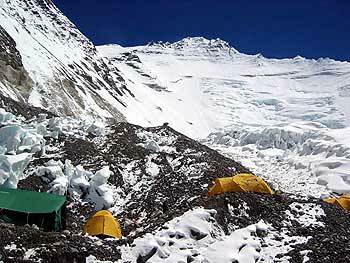 October 6 and I’m calling you from Camp 3 on the Lhotse Face. All the team members are here. Brad and David arrived first with Maegan shortly behind them, then Garry and myself. It was spectacular (unaudible). We arrived and I looked around and I responded to David that you can never feel at home in a place this big. 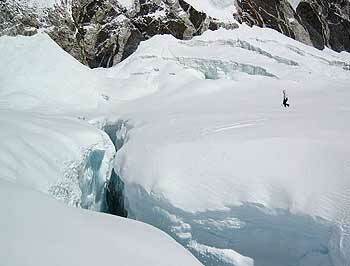 And that’s what I felt like, I felt like a little kid that I was actually on the Lhotse Face. I can look across at the Yellow Band. Brad and I were just sort of hooting and hollering that we were actually here, sharing this moment. Speaking of sharing things, I have to say we’re probably sharing some headaches tonight [laughing in background]. Maegan is the Headache Queen. She has the best one. But not the only one. If I’m talking a bit quietly right now it’s because I’m in a tent with Maegan and Garry. And a short distance away, there’s another tent with Brad and David. 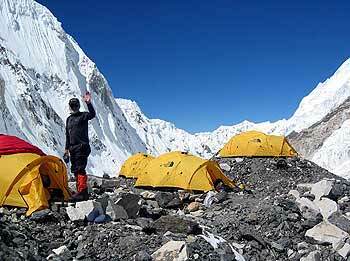 And this is our home on this little tiny ledge at 23,400 feet or about 7132 meters on the Lhotse Face. We’re going to settle down, nurse or at least deal with our headaches. This is a kind of a wake-up call for our bodies. It will pay off when we return. When we return for our summit attempt, we’re going to feel much better here. Tonight, it’s going to be a long night. We’re having our AlpineAire dinners and drinking and hydrating. I won’t call it cozy but I will call it secure and I will call it really wonderful to be on the Lhotse Face with such a wonderful team and to have all the members here.